It hardly needs to be said that many, myself included, did not consider JPII a conservative Pope. Quite the opposite. Ratzinger solidly supported the progressivist initiatives and errors of JPII regarding religious liberty, conciliar ecumenism, collegiality, unity of the Church, and feminism that have changed the face of the Catholic Church since Vatican II. In fact, in the theater of the last Papacy, where JPII was the on-stage star, one might say Ratzinger was a behind-the-scenes director of the production. Now that the director was given a stage role, my first indication was to think things would continue along the same progressivist pathway. More of the same, with no real change in sight. Because of an artificial propaganda campaign presenting Ratzinger as doctrinally orthodox and traditional minded, it was not surprising to find media-influenced Catholics ecstatic and hopeful that the progressivist tide had turned with his election, and a grand restoration was en route. It was startling, however, to find sectors, significant sectors, of the traditionalist milieus joining that choir. “Give him a chance,” they were all were insisting, sharing the irrational optimism in the air after the last conclave. Ratzinger's progressivist colors so far unchanged. This was my reaction. But, I decided to remain quiet for awhile and wait a bit to see what Pope Ratzinger would do. Well, he has already begun to reveal his position. The first actions and addresses of Benedict XVI give no cause to imagine that the progressivist Cardinal Ratzinger has changed colors. Although much could be said about his progressivist stances as Cardinal, let me limit myself in this article to pointing out some of the things Ratzinger has said and done since he was raised to the Papacy. 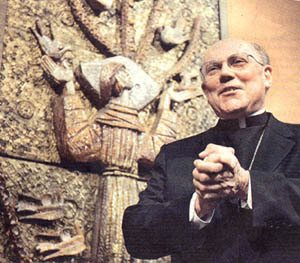 One of his first statements after the announcement he had been elected Pope was his proclamation of full and complete support for Vatican II. In his first Papal message, he affirmed his “determination to continue the commitment to put the Second Vatican Council into practice, following in the footsteps of my Predecessors.” (1) It is the application of the Vatican II agenda, let me note, that has led us into the abysmal crisis of Faith and Morals that the Church is suffering today. He then went on to firmly commit to continue the policies of JPII with regard to the false religions. A top priority, he affirmed, was to maintain “an open and sincere dialogue” with the false religions. Later, in his first official address to delegates of the pagan, Jewish, heretical and schismatic sects, he emphatically affirmed “the irreversible commitment assumed by Vatican Council II” to journey on the “path toward full communion(2). This is the same progressivist jargon the Popes since John XXIII have been using to mask the progressivist aim of establishing a pan-religion where all men, believers or not, are brought together into a single universal church. Benedict 16 also addressed the members of the Muslim community and expressed his desire to build bridges with followers “of all the religions” to seek “the true good of all persons and of the whole society” (3). The Catholic faithful continue to get more doses of progressivist lingo, with Pope Ratzinger addressing the sects as if they were on same footing as the Catholic Religion. After two and a half decades of JPII, many people have become accustomed to this kind of talk, hardly realizing it promotes religious indifferentism, a serious doctrinal error strongly condemned by the pre-Vatican II Popes, especially St. Pius X. It is not the language of a conservative Pope defending tradition. Then he sent out invitations to his installation as Supreme Pontiff to the Grand Rabbi of Rome, the head of the Anglicans, Schismatic hierarchs, and leaders of some 130 other false religions. The Grand Rabbi declined. Later, on May 13, Benedict XVI re-affirmed his commitment to further the relations with the Jews set by John Paul II by announcing he would visit the synagogue of Cologne, the oldest in Germany, during his trip to World Youth Day in that city (4). As everyone knows, JPII was the first Pope to visit a synagogue, the one in Rome, in April 1986; Benedict 16 will be the second. Another bad sign showing that Ratzinger has decided to adopt the egalitarian spirit of the last Pontiffs was his choice of an “installation” to initiate his pontificate instead of papal coronation. It signaled a decision to follow the examples of his recent predecessors and continue to move in the direction of less monarchical and more democratic Papacy. Another shocking innovation at the “installation” ceremony was the inclusion of a woman among the 12 people representing the Apostles who knelt and kissed the Pontiff’s ring (5). I really don’t know what Apostle she was representing… At any rate, it is the first time in History that a woman took part in this ceremony. Does it speak of more concessions to progressivist demands that women assume more dominant roles in the Church? I think it does. Then, we come to the appointments. “Wait and see – things will change when he begins to name conservative ecclesiastics to important positions,” I was told. Well, shortly after his installment, Benedict XVI reinstated the full curia of John Paul II (6). It is curious to note that many conservatives, and even some naïve traditionalists, used to blame this very curia for the progressivist policy of JPII. They always tried to save JPII, protesting that he was a conservative being manipulated by a progressivist inner circle. So now, what? 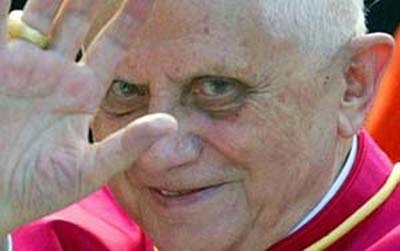 Ratzinger reinstates the whole group. One thing for sure, if anyone knew the progressivst policies of a Cardinal Walter Kasper or Roger Echegaray, it was the insider Ratzinger. And if he had wanted to make a clear statement that he would be steering the Bark of Peter on a different path, this would have been the moment to do so. But he did not. On the contrary, he confirmed all the progressivists in their positions. The few major appointments Ratzinger has made should raise no cheers in the stands of conservatives. For example, on May 13, he announced the choice of his successor as prefect of the Congregation for the Doctrine of Faith (CDF): the American Archbishop William Levada (7.) The San Francisco Prelate is on record as supporting homosexual rights and the benefits that come with “legal” civil unions (8). He is also accused of blocking the release of the findings of a panel investigating priestly child abuse in his Archdiocese (9). Levada was Archbishop of Portland from 1986 to 1995, and there he was accused of covering for two priests charged with molesting boys (10). Ironically, the Congregation he was chosen to head has the juridical responsibility for handling cases of priests accused of sexual abuse… A friend of traditionalists? Hardly. Levada has refused to permit even an indult Tridentine Mass in his Archdiocese. Finally, let me remind you, Jan, that it was Cardinal Ratzinger who worked tirelessly for suppression of the Fatima message. He and his top aide, Cardinal Tarcisio Bertrone, did all they could to bury the Fatima message in June 2000, declaring it a “past event” in the commentary they wrote about the contents of the third message of Fatima. Despite the fact Ratzinger had insinuated in the past that the secret referred to a crisis in the Church, he interpreted the supposedly revealed secret, a vision of a bishop in white climbing a hill littered with corpses of martyrs who was suddenly cut down by a fusilade of bullets, as the failed assassination attempt on JPII’s life in 1981. With this arbitrary interpretation, he pretended that the Fatima message had ended, and therefore all speculations should cease. A good portion of the Catholic public did not swallow this story. Regarding known points of the revelations, Ratzinger even went so far as to suggest that the vision of Hell Our Lady showed the children on July 13 might have been the active imagination of children under the influence of pre-Vatican II teaching. Then, after the death of Sister Lucy in February 2005, it was Ratzinger who ordered Sister’s Lucy’s cell sealed, to prevent any further disclosures on the topic he had declared closed. I waited until the anniversary of the first apparition of Our Lady of Fatima – May 13 – to see if Benedict 16 would perhaps take a different stance on the Fatima message, as many conservatives were buoyantly predicting. Would he speak of the need to consecrate Russia to the Immaculate Heart or encourage a devotion to the First Saturdays as Our Lady asked? He did not. On May 11, he spoke a few words, telling “believers” to turn “with confidence to Mary” as he reminded them that May 13 was the feast of the Virgin of Fatima. (11) That was all. The chapter is closed. Nothing about the errors of Russia or the corruption of customs Our Lady came to warn us about; nothing on the imminent chastisement she predicted; nothing about the need to consecrate Russia to the Immaculate Heart following Our Lady’s specifications. In fact, to the contrary, Ratzinger has indicated he will follow the same shameless policy of JPII with regard to the schismatic Russia. To overcome obstacles in the Rome-Moscow relationship, he has already assured the Moscow patriarch that the “Roman Catholic Church is not going to proselyte among the Orthodox Christians.” (12) Ignoring Our Lady’s command that Russia must convert, he is ordering Catholic missionaries to step back and give up efforts to convert the Russian people. The policy is alarming not just because it is an affront to Our Lady, but also because it denies the missionary character of the Church. Cardinal Joseph Ratzinger has done enough and said enough as Benedict XVI to quash the optimism of conservative and traditionalist Catholics. I hope a spirit of objective analysis will set in soon. As the maxim says, undeserved praise is scandal in disguise. 1. “First Message of His Holiness Benedict XVI at the end of the Eucharistic Concelebration with the Members of the College of Cardinals in the Sistine Chapel,” Vatican online, April 20, 2005. 5. “Benedict Emphasizes Service,” National Catholic Reporter, May 6, 2005, p. 5. 6. “New Pope Keeps Vatican Hierarchy Intact,” ABC News International online, April 22, 2005. 7. “American Succeeds Pope in Former Office,” Zenit, May 13. 9. “Levada Takes Heat Over Abuse Inquiry,” San Francisco Chronicle online, November 12, 2004. 12. “Vatican Ready to Overcome Difficulties in Orthodox-Catholic Relations,” RIA Novosti online, April 26. A Conversion? Questions about Ratzinger's Dominus Jesus?